IT IS FINALLY COMING SEPTEMBER 30TH, 2013. The continuing and thrilling adventures of Olivia Black, her ghost hand, and the PSS crew. What did GHOST HOLD beta readers have to say about it? Started and finished Ghost Hold today, it was that amazing! And that ending, Holy Crap Ripley, you’ve outdone yourself. I’m already impatient for the next book! ARE YOU A BOOK BLOGGER OR REVIEWER WHO LOVED GHOST HAND? 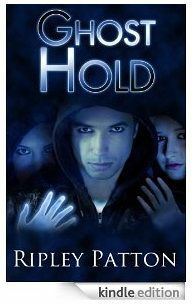 Advanced reader copies of GHOST HOLD are currently available in most e-book formats. If you’d like one, please e-mail me at ripleypatton(at)gmail(dot)com with a request for one. I look forward to hearing from you. Please send me a link to your book blog or review site with your request. Please schedule to blog and review about Ghost Hold in late September/early October during its launch. Any promotion through social media like Twitter and Facebook is also appreciated. Please be aware that you are receiving an Advanced Reader Copy of an unreleased book. The file is not to be shared in any way, and please no spoilers. Please note that I can’t send out ARCs to fans. Yes, I love my fans, and will occasionally run ARC giveaways on my website, but if I gave an ARC to every fan who wanted one, I wouldn’t sell any books. Thank you for your understanding. THE GHOST HOLD BLURB IS HERE! Yes, I now have the official blurb for Ghost Hold, book two of the PSS Chronicles. READ and ENOY! Be sure to let me know what you think, and don’t forget to ADD GHOST HOLD to your Goodreads TBR list HERE.